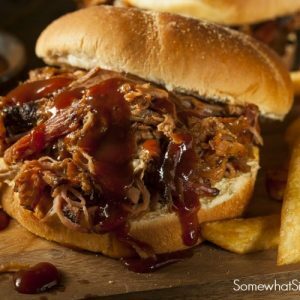 These Crock Pot BBQ beef sandwiches are cooked to perfection and dripping with flavor! Not only are they delicious but they are super easy to make. Pot roast- any size big enough to feed your crew. You could use any cut of meat too- a round roast rump roast- whatever is on sale! Take your thawed roast* and place it in the crock pot. Pour an entire bottle of BBQ sauce over the top of the roast. Fill the empty BBQ sauce bottle with water, shake it up to get the rest of the sauce off the sides and then pour that over the top of the roast. Add enough water so that the meat is mostly covered in liquid. Put the lid on the crock pot on and cook for 4-6 hours on high or 6-8 hours on low. 30 minutes before serving, shred the meat with 2 forks and place it back in the crock pot. Let it cook uncovered on high for the last 30 minutes to burn off some of the excess liquid. Serve inside soft buns and add more BBQ sauce if you want.